The types of Main Battle Mechs and other armored fighting vehicles that were deployed during the Naplian Campaigns and the Cyber Rebellion number in the hundreds. 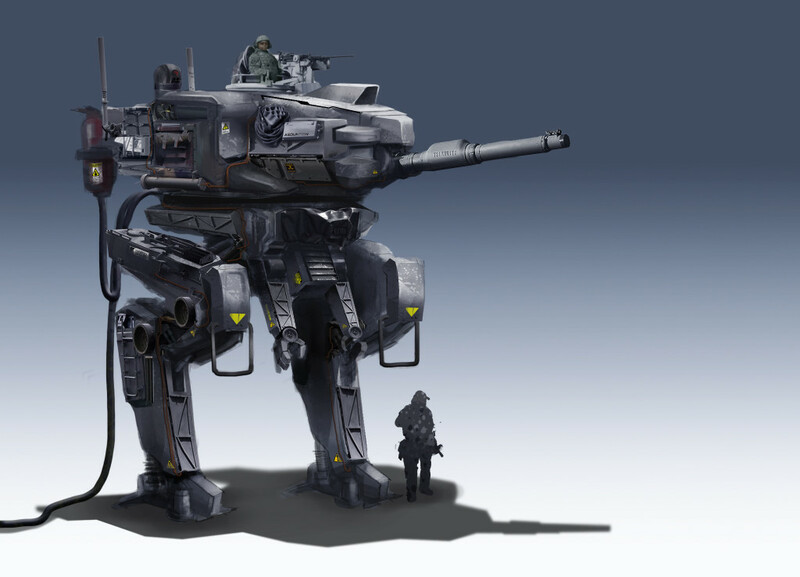 Armored Mechs were mounted on two, three, four or six legged chassis. One of the more common variants was the two legged H56-MBM (Main Battle Tank) chassis produced by Sol Systems Armor, LTD. Various turret configurations were mounted on this chassis during the 127 years of production. The H56 saw action at Baedecker 4, Kleeman 7, and the Great Rift Desert Systems. Hundreds of H56 brigades were still operating along the Rimward Frontier at the beginning of the Cyber Rebellion and helped to slow the cybernetic advance into human regions. The H56 Brigade will be one of many armored formations that player empires will be able to build as they research ancient technologies and develop their armed forces. The Mech pictured is an H56 Mark 5e. It carries a 127 mm rifled plasma gun as its main weapon. Earlier models were equipped with the Marken 100 mm rail gun. The Mark 5a mounted a Vulkmer Corporation short barreled 150 mm howitzer and the Mark 5d was armed an Aeros Offworld Industries (AOI) short barreled 95 mm particle beam main gun.